PONTE VEDRA, Fla. — The Russian space agency, Roscosmos, on Aug. 25 said it may still proceed with a planned Friday (Aug. 26) launch of a Glonass navigation satellite aboard a Soyuz rocket despite the failure yesterday of another Soyuz variant carrying an unmanned supply ship intended to dock with the international space station. In a statement, Roscosmos said its chief, Vladimir Popovkin, and senior officials from Soyuz component manufacturers met today (Aug. 25) to determine whether the failure of the Soyuz-U rocket should force the grounding of the Soyuz-2.1b vehicle equipped with a Fregat upper stage. The statement said Popovkin had assembled a group of experts that will decide whether commonalities between the Soyuz-U and Soyuz-2.1b vehicles are such that both should be grounded until a board of inquiry establishes the cause of the Soyuz-U failure. The planned Aug. 26 launch is of a new-generation Glonass satellite. Glonass satellites typically are lofted by heavy-lift Proton vehicles, three at a time. Russia has invested heavily in returning Glonass to full service, and expects the constellation to be fully operational this year or early in 2012 despite the December loss of three Glonass spacecraft following the failure of a Proton vehicle. 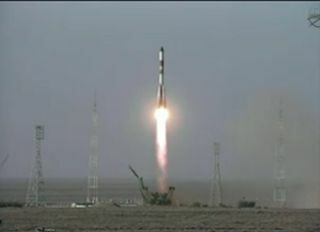 Roscosmos now has two failure investigations to manage simultaneously. A Proton rocket using the Breeeze-M upper stage placed the large Express-AM4 telecommunications satellite into a useless orbit Aug. 18 following what Roscomsos said appears to be a failure of the Breeze-M’s guidance system. Proton launches have been suspended pending the results of the investigation.